The Internet in China reflects many contradictions and complexities of the society in which it is embedded. Despite the growing significance of digital media and communication technologies, research on their contingent, non-linear, and sometimes paradoxical impact on civic engagement remains theoretically underdeveloped and empirically understudied. As importantly, many studies on the internet’s implications in Chinese societies have focused on China. 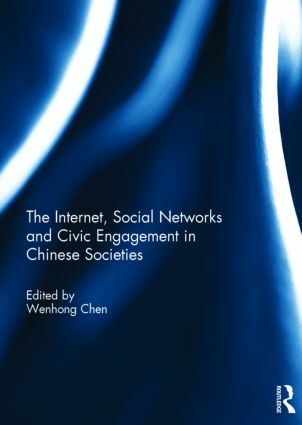 This book draws on a variety of theoretical and methodological approaches to advance a balanced and context-rich understanding of the effects of digital media and communication technologies, especially social media, for state legitimacy, the rise of issue-based networks, the growth of the public sphere, and various forms of civic engagement in China, Taiwan, and the global Chinese diaspora. Using ethnography, interview, experiment, survey, and the big data method, scholars from North America, Europe, and Asia show that the couture and impacts of digital activism depend on issue and context. This book was originally published as a special issue of Information, Communication & Society. Wenhong Chen is an Assistant Professor in the Department of Radio-TV-Film at the University of Texas Austin, USA. Before joining the faculty she earned her PhD in Sociology from the University of Toronto, Canada, and was a postdoctoral researcher at Duke University, USA. Her research has been focused on the social implications of digital media and communication technologies. She has published more than 20 articles, including publications in Journal of the Association for Information Science and Technology, New Media and Society, Journal of Computer-Mediated Communication, the Information Society, Management and Organization Review, and Entrepreneurship Theory & Practice.